Yachimovich: Lapid's "Future" party should be renamed "Past." He is taking orders from Netanyahu’s staff. 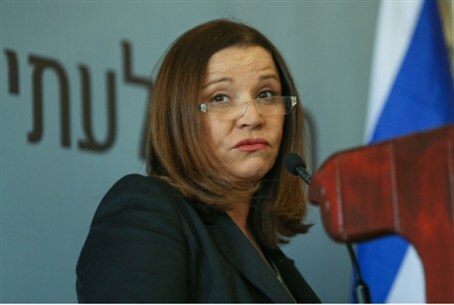 MK Shelly Yachimovich (Labor), head of the Opposition, criticized Yesh Atid leader Yair Lapid on Sunday for his recent statement that the government will need to make budget cuts after previous governments “partied” and ran up an overdraft. “There is a past,” she wrote on Facebook, mocking the name of Lapid’s party, Yesh Atid – There is a Future. “Lapid woke up in the morning sounding exactly, but exactly, like Netanyahu,” she said. Pretending to write in Lapid’s voice, she continued, “My brothers, the workers, you will keep being the state’s ATM and paying the price. My fellow workers, I don’t understand economy, like I told you, but I’m getting my first lessons in economics from the Finance Ministry officials. “But something new really is starting: you’ll be hearing about the budget decrees, the spending cuts and the taxes on Facebook,” she said. “They told me to tell you, like Bibi, right before I continue the old economic policy, that ‘I received the economy in a terrible state’ and there’s no choice. I learned quickly, and within hours I understood that you were responsible for the situation… Tonight I learned that until now you were all partying. Social workers, teachers, construction workers, hi-tech workers, young doctors, students, the elderly, single mothers, factory workers – you’ve partied enough, the party is over,” Yechimovich wrote. “Yes, you’re working more and earning less, yes, buying an apartment has become a fantasy, yes, the price of food has skyrocketed, yes, you’re paying for education and health, which are supposed to be free. You partied, huh? From now on, it will be worse… But with me, it will be with a smile,” she said. Yachimovich accused Lapid of planning budget cuts that would disproportionately affect the middle and lower classes. “The big corporations will keep on not paying taxes… Salary freezes and taxes on savings funds for teachers is much easier than slightly limiting the salary of senior officials who get one million shekels a month,” she wrote.